Videos, examples, solutions, stories and songs to help Grade 5 students learn how to multiply and divide by powers of ten. When we multiply a number by a positive power of 10, we move the decimal point of the number to the right. When we multiply a number by a negative power of 10, we move the decimal point of the number to the left. The number of places to move would be equal to the index of 10. 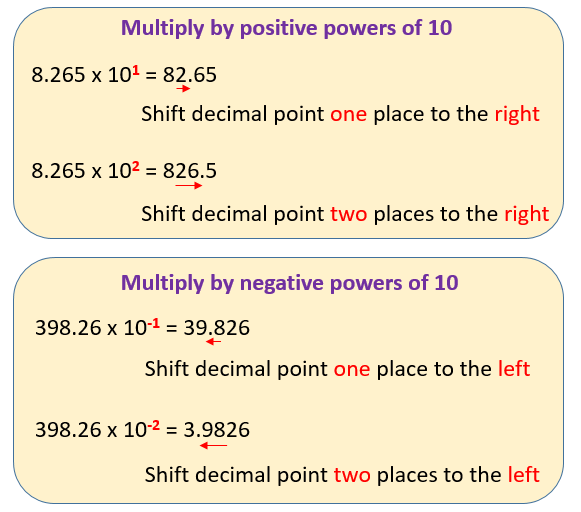 The following diagrams give more examples of multiplying by positive powers of 10 and negative powers of 10. Notice that 10n in expanded form is 1 followed by n zeros. This video explains how to multiply whole numbers and decimals by powers of ten. In this lesson you will learn to multiply whole numbers and decimals by powers of ten by using your understanding of place value. Learn to multiply decimals by 10 and its powers. Learn to multiply decimals by multiples of 10. A single postage stamp costs $0.44. How much would a roll of 1,000 stamps cost? In this lesson, you will learn how to multiply numbers by powers of 10. We will learn that multiplying by a power of 10 simply moves the decimal point and allows the student to multiply very rapidly by large numbers.